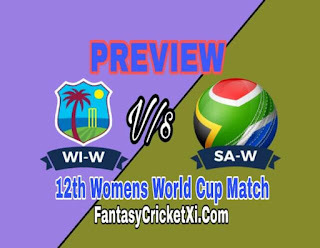 Match : WI-W vs RSA-W, 12th Match, Group A, ICC Womens World T20 2018. Date : Thursday, November 15, 2018. Pitch Condition : Pitch Is Expected To Be Bowling Friendly. Matches won batting first 5. Matches won bowling first 9. WI-W 155/5 lost to 156/7 SA-W 06/10/18. WI-W 135/3 lost to 136/2 SA-W 04/10/18. WI-W match abandoned SA-W 30/09/18. WI-W 102/1 beat 101/8 SA-W 28/09/18. WI-W 124/6 beat 107/7 SA-W 24/09/18. Merissa Aguilleira (wk), Shemaine Campbelle, Deandra Dottin, Anisa Mohammed, Stafanie Taylor (c), Kycia Knight, Natasha McLean, Shakera Selman, Chinelle Henry, Shamilia Connell, Britney Cooper, Afy Fletcher, Hayley Matthews, Chedean Nation, Sheneta Grimmond. Mignon du Preez, Marizanne Kapp, Dane van Niekerk (c), Shabnim Ismail, Chloe Tryon, Sune Luus, Moseline Daniels, Lizelle Lee (wk), Masabata Klaas, Yolani Fourie, Laura Wolvaardt, Zintle Mali, Robyn Searle, Faye Tunnicliffe, Tumi Sekhukhune. ➤ Anisa Mohammed Has Pointed To Her Record 100th T20I When West Indies Clash With South Africa Here Tonight. ➤ They Played 1 Match And They Won By 60 Runs Against Bangladesh Women’s, They Confident Level Will Be High. ➤ West Indies Top Order Filled In Last Match Only S Taylor(29), N McLean(11) And Kycia Knight(32) Runs Scored. 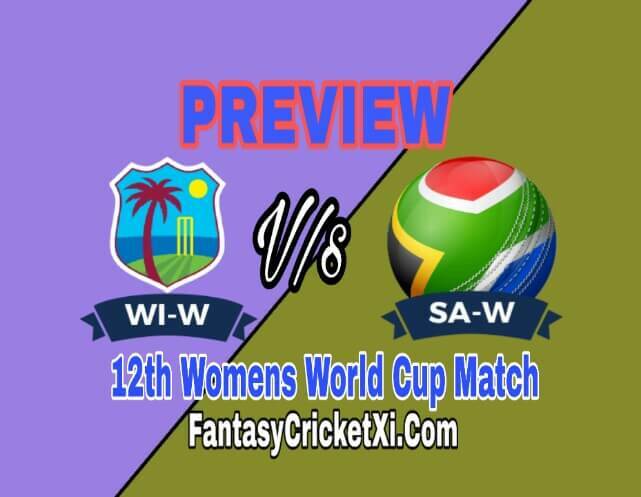 ➤ Deandra Dottin Took 5 Wickets Her Career Best, And Shakera Selman Also Took 2 Wickets. ➤ They Will Be Go With Same Playing11. ➤ They Win The 1st Match By 7 Wickets Against Sri Lanka. ➤ Last Match Opening Pair File But Marizanne Kapp(38), And Dane van Niekerk(33) Runs Scored. ➤ All Bowlers Did A Good Spell And All Get One One Wickets Mainly S Ismail 3 Wickets Took. ➤ South Africa Probably They Can Go With Same Team. Opener : Hayley Matthews Open With Deandra Dottin. Middle Order : Shemaine Campbelle, Natasha McLean, Kycia Knight . Opener : Lizelle Lee Open With Laura Wolvaardt. Middle Order : Chloe Tryon, Dane van Niekerk, Mignon du Preez, Sune Luus. Fast Bowler : Moseline Daniels, Tumi Sekhukhune, Masabata Klaas,Shabnim Ismail,Chloe Tryon Marizanne Kapp.